Christmas to me is all about having fun. It is about stuffing yourself silly with “special edition treats” that you can only find around this time of the year. It is about watching Christmas movies on lifetime that some might consider cheesy. It is also about slipping in your Christmas wish list to your loved ones and hopefully, you’re not on their naughty list. And sometimes, it can also be nostalgic. And lately, I am all about that. So for this post I would like to share with you – my friends, what I did last year. 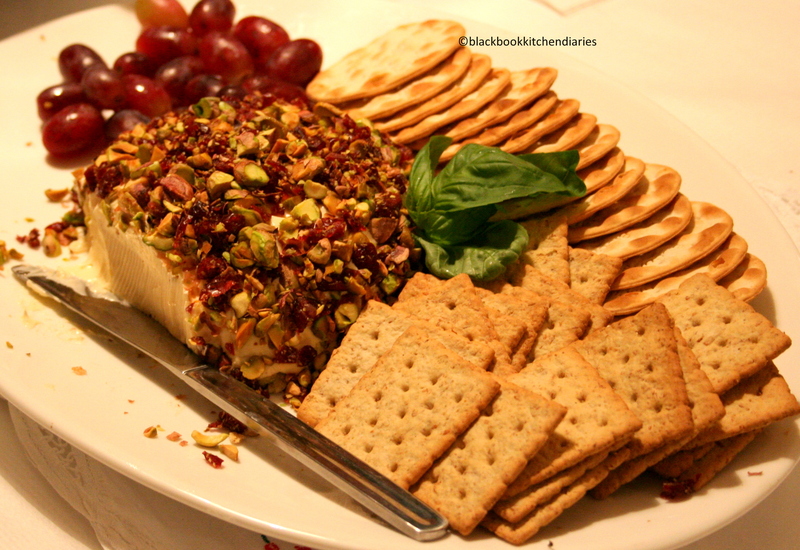 I made a holiday cheese ball studded with pistachios and cranberries for my sister’s awesome Christmas party. 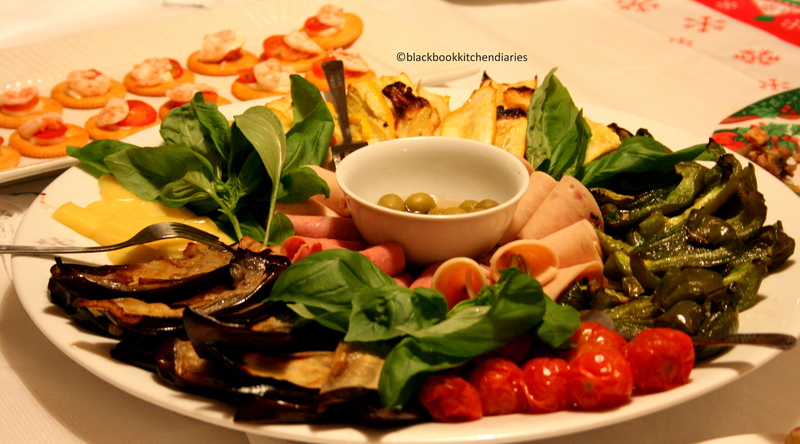 And my mom made her famous antipasti platter. 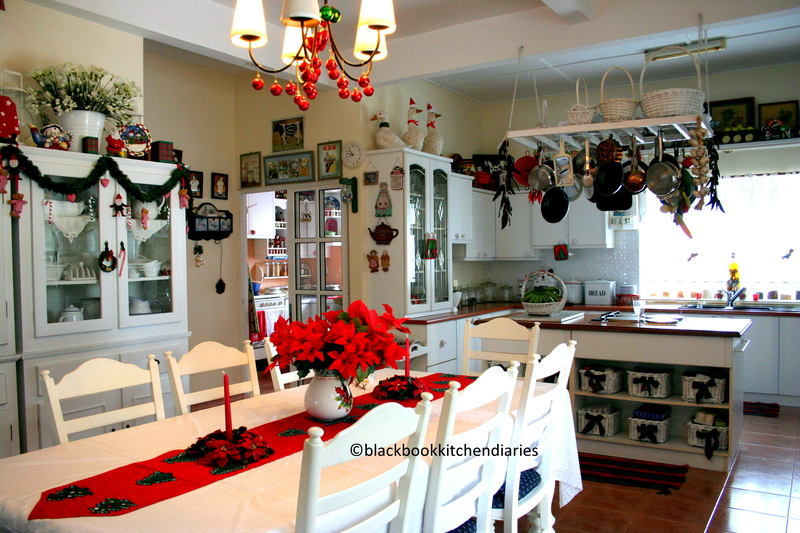 I also did my Christmas baking in this beautifully decked up kitchen. I know, right? I brought a tray of these super cute cupcakes to my aunt’s Christmas Eve party. I used my favorite chocolate cake recipe and then decorated them with fondant for that Christmassy look. There is a melted showman, some Christmas hollies, and the little gingerbread men. 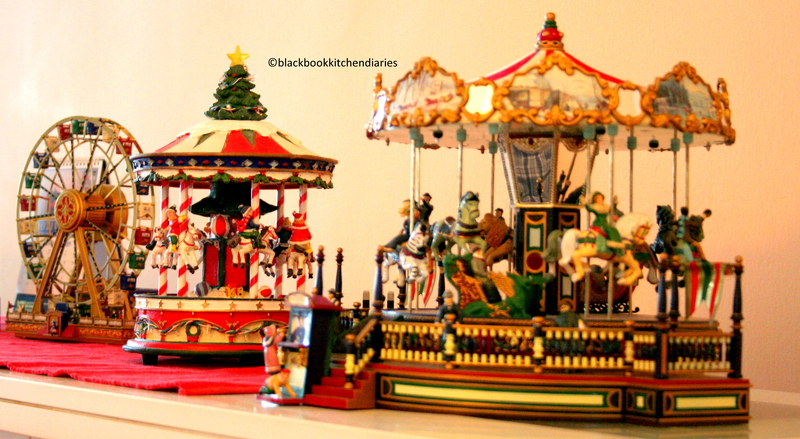 These are some of my mom’s precious collections that she proudly displays every year. 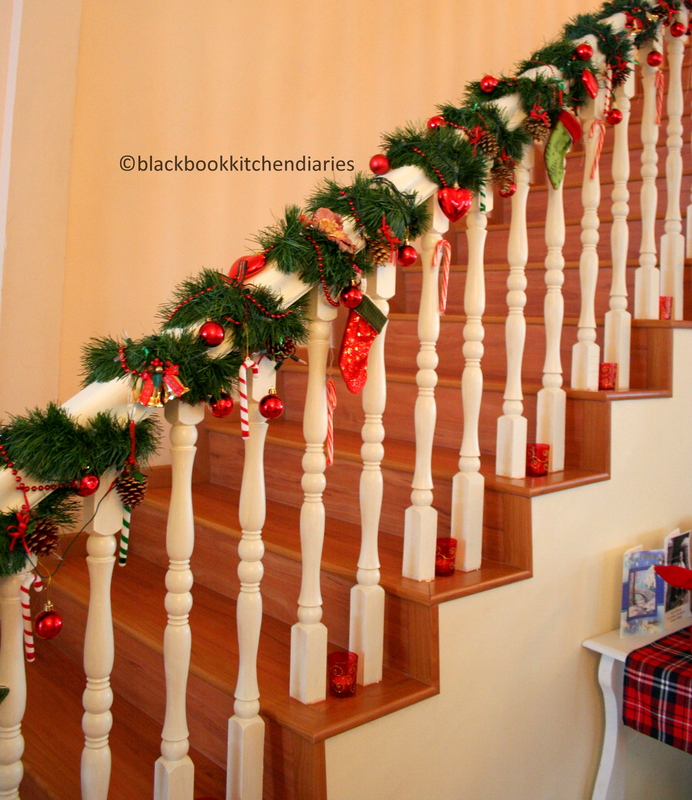 And then, there is this pretty banister that is all dressed up for the season. It can’t get any better than that. Wow, this just looks too perfect. I love it. Very festive. Hope you share what you do this year!! Those cupcakes are too cute for words. Love! The cupcakes are almost as gorgeous as your kitchen! We definitely need a lesson on those! There are a few key things that need to happen to get me geared into a festive energy. A fabulous carpet of pristine snow powder and great holiday music. The rest just falls into place. Ciao for now and have a great time planning for the upcoming festivities. Looks straight out of a glossy! It will be hard to top but I know you will do it! Stunning – all of it! Your kitchen is so beautifully decorated. So festive , so homey! I hope you will make beautiful things this year also. Those cupcakes are to die for! Absolutely ridiculously adorable. I am happy to report that you have officially put me in the Christmas spirit! That kitchen is to die for!! And it is wrong that I want to eat that cheeseball for breakfast??? The cupcakes, the kitchen, the banister – my goodness! This post is full of Christmas beauty. Thanks for sharing. Have a great weekend! Love, love, love your tray of cupcakes! Yum! There’s just nothing better than a holiday-ified house, baking, and delicious food. Nothing! 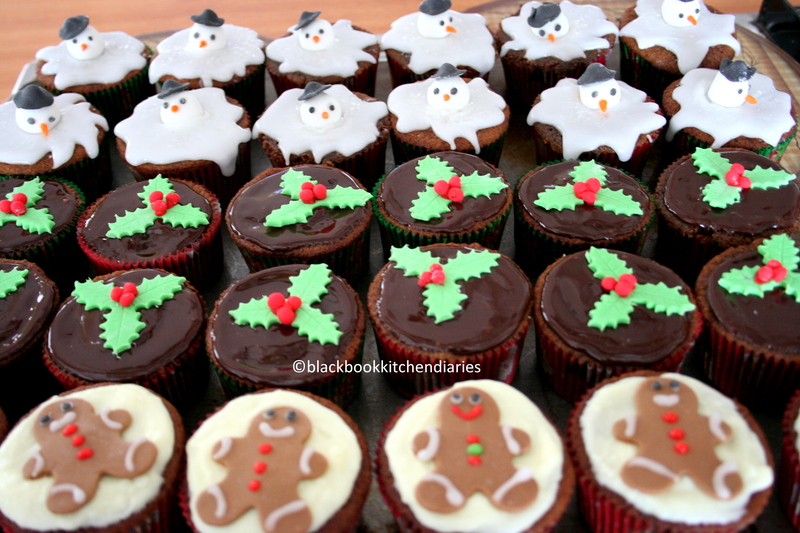 Loving those melting snowman cupcakes! I want to party at YOUR house! I love those cupcakes. They are about the most precious holiday treat I’ve seen! And that kitchen…just beautiful! What a wonderful place to prepare and share Christmas eats. Thank you for sharing sweet friend. I hope you have a wonderful weekend! I loved this post! Your kitchen looks like Mrs. Claus’s! I would love to bake in there with you. In fact, all your decorations are adorable AND your cupcakes are wonderful! Those cupcakes look perfect! I love watching Christmas movies at this time of year. My favourite is It’s A Wonderful Life, it makes me cry every time! Beautiful job on those cupcakes. The little melted snowmen are so creative and adorable! What a beautiful home! And those cupcakes are just darling, I love. Your mum has lovely taste. Everything looks so pretty! And so delicious! That kitchen is gorgeous – I dream of having one like it some day. I love the melted snow man! My girls would get a kick out of that. Thank you for sharing your list of what Christmas means to you…I agree and find similarity on all points (must watch A Christmas Carol and It’s a Wonderful Life, every year about this time). A lovely post reflecting back. I luv your kitchen and decor…what a culinary dream! on December 13, 2010 at 7:03 pm | Reply Julie M.
Is that your kitchen?! Holy moly woman! I can see where your inspiration comes from! Your cupcakes are adorable as well! Wow! I want to come to your dinner parties! I am so impressed by your fondant skills, especially since those shapes are so tiny. I’m not terribly detail-oriented when it comes to the decorating bit of baking. I start losing my patience. Kudos to you! Oh look at all those cupcakes -yum! Wow, so pretty what you did last year…everything sure look so perfect for the Holidays…and the cupcakes are SO SO CUTE! Looks like you do the holidays RIGHT! Yes, jealous of the kitchen as well! You have a beautiful home! The cheese ball is perfect for the party! Everything looks wonderful! Looks like you are gearing up to have a fabulous christmas!!! Every treat looks better then the last and the decorations are superb. I want your house and kitchen too! Nothing like a good old fashioned cheese ball. Wow, that kitchen is absolutely stunning! I love your cupcakes…they’re too pretty to eat. Everything is so festive and wonderful. Happy Holidays! Your photos are really inspiring to give us that special Christmas feeling. What a fabulous kitchen! just like in the magazines. You cupcakes are a delight and the cheese ball looks perfect. Absolutely beautiful! All of it is stunning… love the cheese ball… and the antipasti… and the cupcakes… and the Christmas decorations… I could go on! Such a festive post that really gets me in the Christmas spirit! Sounds like a storybook Xmas to me~ I love it when every member of the family contributes; and I love your kitchen and these adorable cupcakes! All the cupcakes are adorable but the melted snowmen are off the charts cute! I love it… can’t wait to see what you have under your sleeves this year. Pistachio covered cheese balls – would love the recipe!!! and also the antipasto platter. Happy holidays! Ok, can I move in with you? I love every picture you posted. I love the snow flakes. I love the Christmas feeling. What a gorgeous kitchen! And, the holiday decorations all look lovely. Your cupcakes look amazing too! Beautiful cupcakes! And this whole post just got my holiday spirit going – thanks for sharing! hey, I made some pecan/cranberry snack mix the other day that I could use to stud a cheeseball. Can’t wait to try it. Thanks for giving me the idea! Love all those pics, decorations, cupcakes… The kitchen is pretty awesome! Sweet! in all senses–I love the memories made throughout the Christmas season. Melted snowmen cupcakes?? I die. Looks like you had a lovely Christmas last year! Waow, the decoration of your kitchen is awesome! The cupcakes look so cute, especially the adorable ones with the gingermen!! Awww, everything looks so enchanting holidayish. And your cheese ball and cupcakes look delicious too. You are a very talented family! Christmas is my very favorite holiday of all time. I love looking at these pictures. Hope you have another wonderful Christmas this year! OMG the decoration is to die for and the cheese ball too. Thank you for those wonderful pictures. Is that your kitchen! I love white kitchens, if I could design one it would be mostly white. Those cupcakes are so cute, I’m feeling nostalgic myself this year. Beautiful, wonderful and lovely. Love this post! Your mom’s house looks like a Christmas wonderland! And who wouldn’t love to cook in that gorgeous kitchen? It literally took my breath away, as did those cupcakes!